It was my grandmother who taught me long ago that blueberries and cornmeal go together. One of the only recipes she ever jotted down for me, handwritten on a notecard, is one for her blueberry cornbread, delightfully buttery and lightly sweetened. I remember bright-yellow batter like sunshine with dark, plump berries bursting in every warm bite. This waffle recipe is a nostalgic nod to her dish. Waffles made with cornmeal take on a beautiful golden hue and get nice and crisp on the outside when pressed in a hot waffle iron. When you bite in, you get the tang of the buttermilk and the sweetness and grainy texture of the cornmeal. I studded the waffles with a generous handful of fresh blueberries. 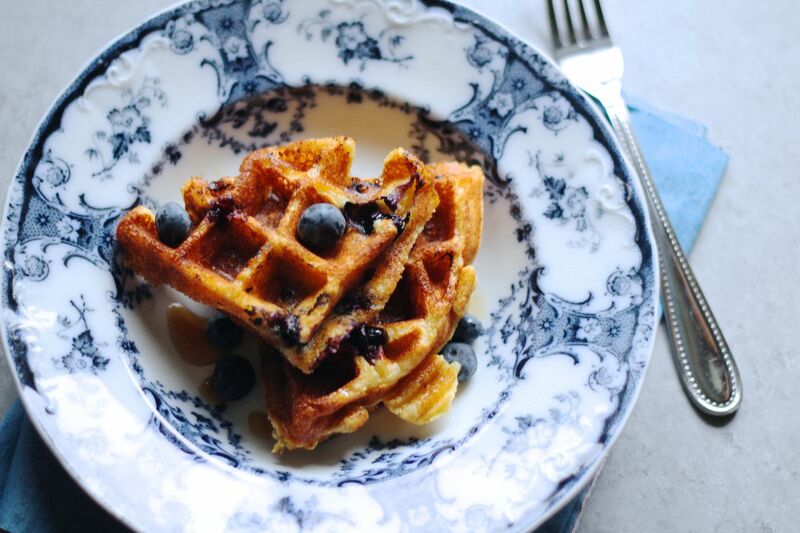 When those berries are pressed by the iron, they explode and stain the waffles an irresistible purple. These waffles would make an ideal weekend breakfast and are a great way to use up the last of the summer's freshly picked blueberries. Preheat your waffle iron. In a medium mixing bowl, stir together the flour, cornmeal, sugar, baking powder, baking soda and salt. In a smaller bowl, whisk together the eggs, buttermilk, vanilla and melted butter. Pour the buttermilk mixture into the dry ingredients and stir together thoroughly to combine and form a thick batter (there may be lumps, but that's OK). Grease the waffle iron as needed with butter. Using a 1-cup measuring cup, scoop the batter into the center of the preheated waffle iron. Sprinkle a generous handful (about 1/4-1/3 cup) of blueberries on top of the batter. Close the waffle iron and cook until golden brown and crisp on the exterior, about 5 minutes. Transfer the waffle to a plate and serve immediately with pure maple syrup and butter. Repeat with remaining batter and blueberries. Note: Waffles get soggy as they sit. If unable to serve immediately, keep waffles hot on sheet pan lined with a wire rack in a 200-degree oven.